Lovebugs, Love Bugs, Lovebug Season, Florida Love Bugs - The Love Bug Solution - Best Lovebug Cleaner, Easiest Lovebug Remover - Protects Vehicles from Love Bug Damage! The love bug, also spelled love bug is a member of the family of march flies. The adult is a small, flying insect common to southern United States including Florida, Texas, Alabama, Georgia, North Carolina, South Carolina and Louisiana. During and after mating, adult pairs remain coupled, even in flight, for up to several days. Two major mating flights occur each year. In late spring, April and May and in the late summer, August and September. Sometimes, in south Florida, a third but smaller flight can occur in December. Flights extend over periods of four to five weeks and love bug flights can number in the hundreds of thousands. Mating takes place almost immediately after emergence of the females. Adult females live only three to four days, while males live a little longer. Lovebugs plastered on car. Acid from the smashed lovebug bodies etch vehicle paint if allowed to remain on very long. LOVE BUGS, NOT LOVED BY MOTORISTS! Love bugs! 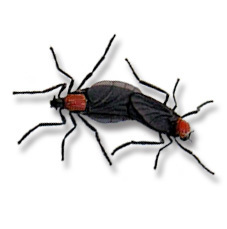 Their name may suggest that they are a bug to love but ask anyone who has had an encounter in their vehicle with Lovebugs, these bugs can do some serious damage to a vehicle's paint and chrome! This species' reputation as a public nuisance is due not to any bite or sting (it is incapable of either), but to its slightly acidic body chemistry. 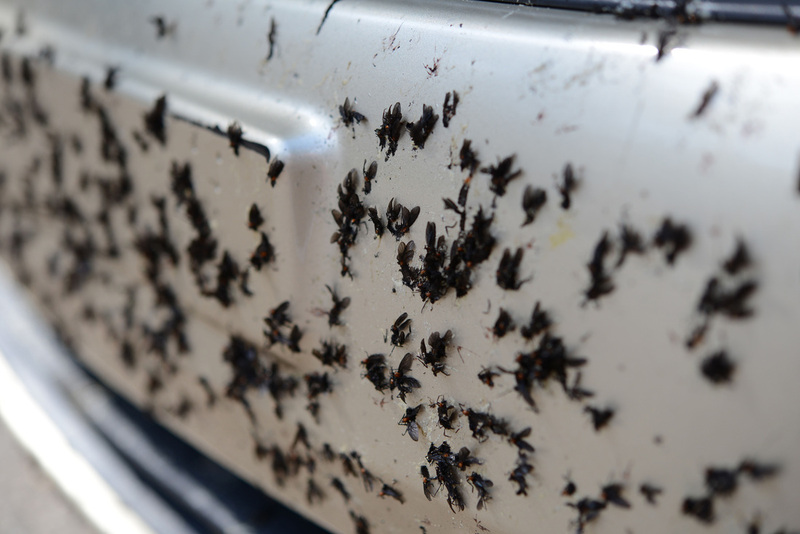 Because airborne love bugs can exist in enormous numbers near highways, they die in large numbers on automobile windshields, hoods, and radiator grills when the vehicles travel at high speeds. If left for more than an hour or two, the remains become extremely difficult to remove. Love bugs become acidic when the bugs dead bodies are left on the car even after just a couple of hours in the hot sun! The acidity of the dead adult body, especially the female's egg masses, often resulted in pits and etches in automotive paint and chrome if not quickly removed they are also known to clog a vehicle's radiator air passages with the bodies of the adults causing the vehicle to overheat. Now with Bug Shield On Demand™ you don't have to worry about the acidy doing damage to the paint and chrome of your vehicle. Bug Shield On Demand™ is sprayed directly on the vehicle and when dry, creates a clear protective barrier between the bugs and paint. Bugs stick to the barrier not the paint or chrome!